Chances are that if you have started researching massage chairs—or even taken a casual glance—you have heard of Fujita. 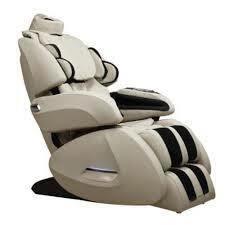 Fujita is a top manufacturer in the world of massage chairs. They believe in offering amazing products with lots of features but believe in doing so at an affordable price point. The Fujita KN9003 is no exception. Attractive and full of options, the Fujita KN9003 is an advanced machine that is making both male and female buyers very happy. The Fujita KN9003 offers users a unique selection in program. Those that use the chair can choose from either a male mode or a female mode. This is because the creators researched and realized that a male body needs something different than a woman. There are more than just external differences between the sexes. There are muscle-based differences as well. As such, men and women need different massages in order to get the most from the experience. The Fujita KN9003 provides just that. The Fujita KN9003 includes new airbags that are an improvement from past models of the device. These airbags are different because they have a v shape. The v shape bags are especially helpful in the hip area as they serve to provide a deeper and more beneficial massage in this area. The bags can help with releasing muscle tension in areas that have been problems in the past as well as help with digestive issues. The KN9003 has rollers in its system. That means that it can provide a rolling motion as well as vibrations for a more complete massage. This is based on reflexology and the important techniques that can be derived from this theory. This is especially awesome when it comes to the feet. The Fujita KN9003 uses the rollers in this region and that can really help the body feel better and release tension. In addition to rolling, the Fujita also offers stretching as well. This is specific in the areas of the waist and back as well as the shoulders. The stretching motion helps to release tension and open up the back area. It can really be beneficial to those who suffer from back tension or stress that centers in the vertebrae. Making the Fujita even more relaxing is the inclusion of heat. The Fujita KN9003 uses heat to help with circulation and blood flow. It also utilizes this heat to improve muscle strength and get deep into the muscles for a longer lasting massage. As such, it is a great addition to the chair and one of its most important feature. The Fujita KN9003 is a chair that is not short on program options. It has six different settings that are perfect for varying times of the day and for different needs. Simply press a button and you can choose from the weightless option or the night time program that helps with relaxation and sleep-preparedness. This, too, is a coveted feature because some other systems have very few options in programming, making it great for those who want choices. Infrared scanning is another feature on this massage chair. The scanner looks at the body to get a better idea of that individual user’s needs. This is great because, again, it allows for a more customizable massage that better suits the person’s needs. The infrared sensors look at the body and its measurements in order to accomplish this goal. The Fujita KN 9003 is an impressive chair that has many amazing features and extras. From the body scan to the heated areas, it provides deep tissue and deep feeling massages. It also has many benefits outside of these as well. With that said, there are a few drawbacks to purchasing this machine. The following list looks at both the strengths and weaknesses of the chair so that you can make a more informed decision.